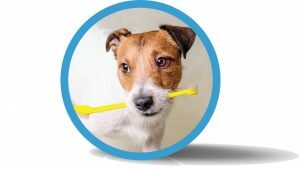 You might have heard about non-aesthetic pet dental cleanings from a local groomer, pet store, word-of-mouth or even some veterinary providers. Commonly known as anesthesia-free dental cleanings, the practice involves scaling of a dog or cat’s teeth without putting the pet under anesthesia. Veterinarians often refer to the practice of scaling the teeth without anesthesia as non-anesthetic dental scaling, as the term “cleaning” is misleading to pet owners who have the impression that after one of these procedures, their pet’s mouth is clean and healthy. So what does the procedure involve? Nobody could expect a dog or cat to patiently sit through the exam, cleaning, cleaning below gum line and x-rays. First, the title of the procedure is accurate in that there is no anesthesia involved. This means your pet must be physically restrained, some at higher levels than others, in order for the provider to access the animal’s teeth. A provider will often tell a pet owner it is just like a human going to the dentist, which is absolutely not the case. Imagine how a pet – that can’t communicate – feels when the non-anesthetic pet dental provider holds open their mouth to perform the procedures. We can understand what the dentist or hygienist is doing, but your pet does not understand and will often require a traumatic restraint process. The next step is using a sharp instrument to remove plaque from the visible part of the tooth, or scaling the crown of the tooth. The discoloration of your pet’s teeth is essentially layers of plaque and bacteria that have built up over time, which is only eliminated from the visible portion of the tooth by using a scaler. At the end of the non-anesthetic dental procedure, the outside surfaces or your pet’s teeth may appear visibly whiter. However, there is much more than meets the eye. Because your pet wasn’t under anesthesia, there was no ability to clean beneath the gum line where the bacteria that cause periodontal disease occur. The best dental care for your pet is a regular veterinary dental cleanings under anesthesia. If you would like more information regarding non-anesthetic pet dental cleaning vs. oral dental cleaning under anesthesia in Idaho Falls, call our office today to schedule a consultation.